Is Your Rug in Desperate Need of Repair? No matter what kind of rug you have we can take care of all your repair needs. If you have a tufted rug with a backing that has gone bad we can remove the old backing and adhesive. From there we can replace the old backing with a new and your rug will hold up for years to come. If you have a machine made rug that needs new fringe we can also take care of this. Stop into our shop and pick out the fringe that you like the most and we will remove the old and install the new. Maybe you have a Heriz, Baluch, Bijar, Hamadan, Isfahan, Kerman, Senneh or a beautiful Sarouk, (just to name a few) with damage from your adorable puppy that decided to eat the corner of the rug. 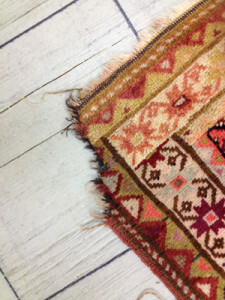 We can reweave the corner and restore the rug to its original beauty. Even if you have a Kyceri or Hereke silk rug we can reweave and restore any damage that the rug may have. We understand that sometimes it is hard to make a decision if a rug is worth fixing. We can help! Bring the rug in and we will inspect the rug and research the rug to make sure it is worth the money you are about to invest. 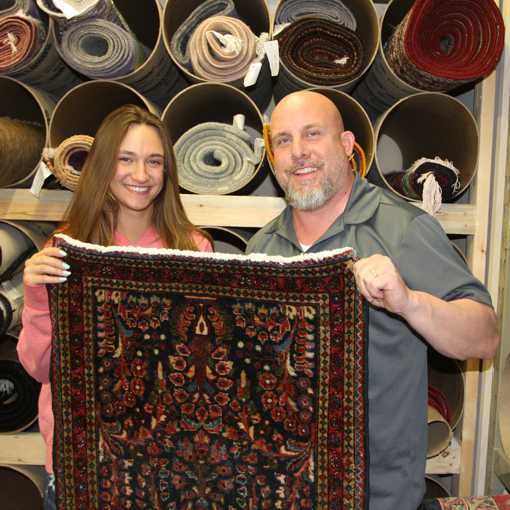 We understand that some of our customers love their rugs and will want to fix them no matter what. We work hard to lay out all the options and we try our best to keep cost down so you can afford the best job available. Use the slider on this rug image to view the Before and After results of a fabulous fringe repair performed by our very own Megan Mayville. Omaha’s Rug Cleaning & Restoration is involved with a team of rug experts throughout the United States. If you have a question about your rug that we can’t answer we will be able to find the answer. If you are in another state and do not wish to ship your rug to us to be repaired, just let us know your location and we will find someone in your area that we can trust to assist you in your rug needs. Do you have beautiful rugs through out your home and need to insure them properly but you don’t have an appraisal? Here at Omaha’s Rug Cleaning & Restoration appraisals are available anytime. To complete the appraisal, it will take about 10 to 14 business days.